Hello everyone. I hope you are all doing fine. The day to day goes by relatively routinely over in my corner of this dusty little city (and I mean dusty in an endearing way, at least to me). Work (lots happening there…of which I won’t bore you with details, fret not), kids, school, play. My mother has moved into our building (now there’s news!) and has managed, even before moving in, to become the chairman (chairperson) of our building association. If you don’t know anything about my mother…that fact would pretty much say it all. Ok, that and the awesome cocido that she makes. And that she has crates of cava squirrelled away. My mom…you’ve just got to love her. Our already interesting neighborhood just got that more interesting. Life here goes on, on its merry, although mostly unglamorous, way. We can’t say the same for many of our countrymen, who are still in miserable conditions, entrenched in the unforgiving aftermath of that deadly storm. And here, on the other side, in these areas that were not affected, we watch helplessly. We do the best we can, we share our time, our resources, anything we can, as much as we can. We sometimes can’t see how it will ever be enough. Yes, life goes one, despite our guilt, either acknowledged or just under the surface, that we are lucky enough to have it go on. Yes, this guilt doesn’t help, but we cannot deny its existence, whether it be a burgeoning emption that has all but taken your appetite or small little hiccups of it under the surface, that only appear when no one is watching. If you have been anywhere near social media in these parts, you know that there is a plethora of contradicting voices. What could have been done. What should have been done. Finger pointing. Admonitions to stop finger pointing. What you should or shouldn’t be posting on social media. Keep quiet and help. Speak up, it’s your right. Really, it’s a din over which you can hardly even hear yourself think. So I just let it be. And do what I believe to be the best I can be doing, all things considered. Which, I think, is what everyone else, in their heart of hearts, is doing as well, despite us all taking different paths to get there. One of those little things that I’d like to do is to use this blog to share with you ways to help, if you would like to. I shared some here already. And here are some others. 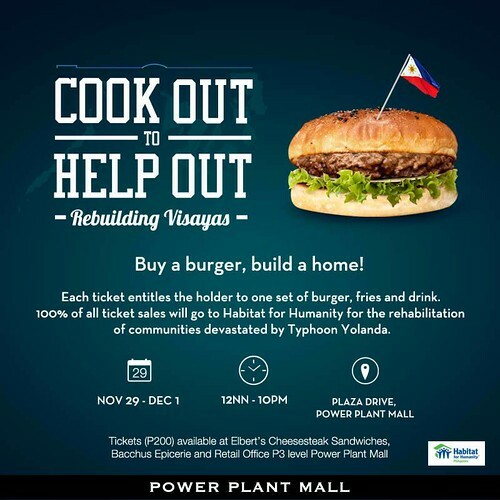 The poster you see above is for another food event, Cook Out to Help Out, whose proceeds go towards rebuilding and rehabilitating the areas stricken by typhoon Yolanda. The other, below, is Operation SANTA, which is a gift drive for the children affected by the typhoon. Both are worthwhile causes which I believe deserve support. Although of course, any and all help counts! It’s back to work now. It’s the busiest time of the year, work-wise, for me. And despite being a bit stretched thin, I am so thankful for it…and for all the normal, unglamorous things I still yet enjoy. I know I haven’t posted a recipe here in a while. But I will soon, I promise. Cooking is still being done and food is still being eaten…and I am still raring to share it all with you! One last thing…Happy Thanksgiving!! Whether you celebrate it or not, there is always something to be thankful for. I know I am certainly counting my blessings.